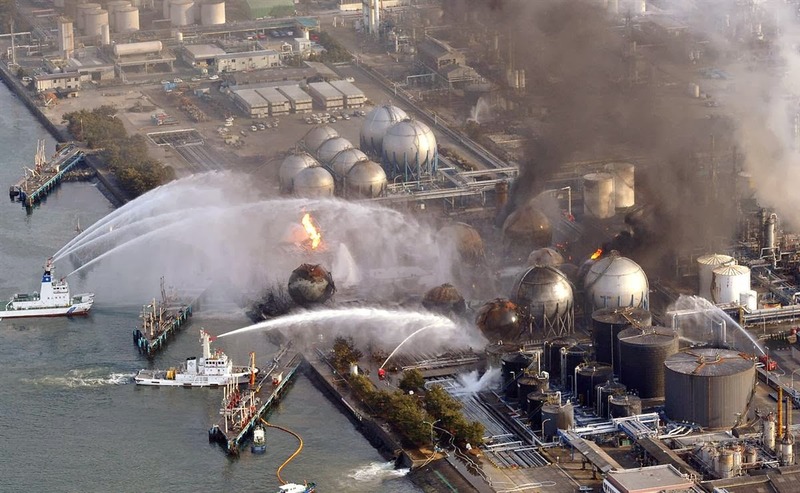 You may or may not have heard about Fukushima, Japan where a few years ago a large earthquake and the giant wave that resulted from it badly damaged a number of nuclear reactors at an electric generating station adjacent to the Pacific Ocean. When the reactors were first damaged, they released a bunch of radioactive material into the air. Prevailing winds being what they are, they carried the radioactive material from east to west and deposited some of it westward of Japan. Supposedly the material reached the west coast of the North American continent in about 3 days and as far as I can tell kept on moving in an easterly direction where it deposited more of this radioactive material. Eventually, I suppose, the radioactive material all drops to the ground and into the water. By now, not much of it is still blowing around. But aside from the initial material released into the air, there is an ongoing release of radioactive water being dumped into the ocean at Fukushima where currents disperse it and bring it to the west coast of North America. The radioactive water is radioactive because it is being used to cool various radioactive materials at the Fukushima generator site. The radioactive water is being dumped into the ocean not as an act of maliciousness, but because so much of it is needed to keep the radioactive materials from melting that there is no place to store it - hence it is dumped into the ocean. 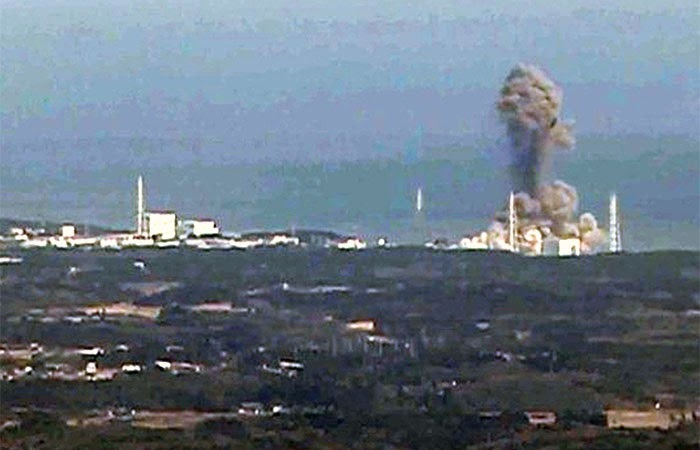 Not cooling the radioactive materials would supposedly cause them to blow themselves into the atmosphere which would be worse than the slower dispersal caused by dumping the cooling water into the ocean. Like all things technological, this was carefully thought out. 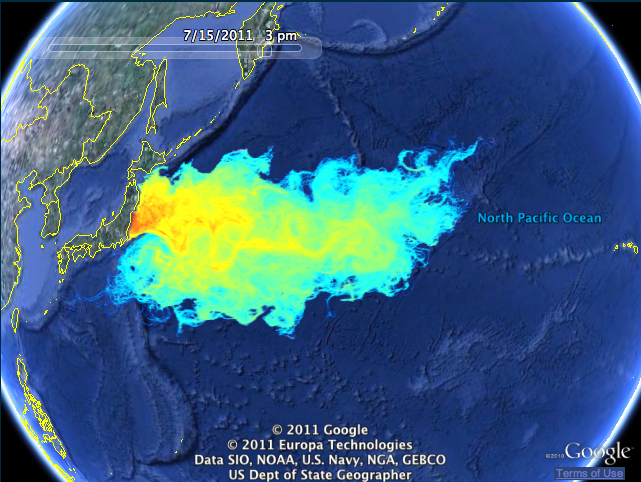 The radioactive material brought to us by the ocean currents takes longer than transport by air. Supposedly 2014, that is, this year is when the first of it arrives on the shores of North America. And thanks to ongoing dumping of radioactive cooling water at Fukushima the plume of radioactive water is getting refreshed with radiation on an ongoing basis. Meanwhile, various life forms in the ocean ingest the radioactive material. Fish do, mollusks do, seaweed does. 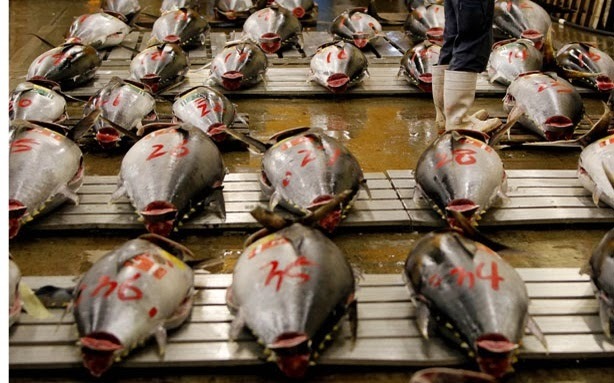 Anything living in the ocean and swimming through the plume of radioactive water generated at Fukushima picks up radioactive materials. What is not clear is how harmful the radiation is. 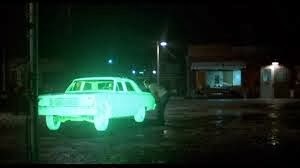 One opinion - from the movie Repo Man quoted here. "J. Frank Parnell: Ever been to Utah? Ra-di-a-tion. Yes, indeed. You hear the most outrageous lies about it. Half-baked goggle-box do-gooders telling everybody it's bad for you. Pernicious nonsense. Everybody could stand a hundred chest X-rays a year. They ought to have them, too. When they canceled the project it almost did me in. One day my mind was full to bursting. The next day - nothing. Swept away. But I'll show them. I had a lobotomy in the end. Parnell: Not at all. Friend of mine had one. Designer of the neutron bomb. You ever hear of the neutron bomb? Destroys people - leaves buildings standing. Fits in a suitcase. It's so small, no one knows it's there until - BLAMMO. Eyes melt, skin explodes, everybody dead. So immoral, working on the thing can drive you mad. That's what happened to this friend of mine. So he had a lobotomy. Now he's well again." I am personally curious - so I bought a radiation detector and started measuring radiation on my own. More on the results in another post.